The day we won our 6th Premiership! Carlton defeated Collingwood by 15 points at the MCG in front of a record crowd. Soapy Vallence and Jim Park played their last games for the Blues. Best: J.Hale (BOG), J.Wrout, M.Crisp, B.Diggins, B.Green, F.Gill, J.Park, F.Anderson, J.Francis. The crowd of 96,486 was a crowd record for a Grand Final at the time. Carlton entered the game as an underdog after a poor performance during the Semi Final against Geelong and having overperformed during the year. The Collingwood captain, Albert Collier, came into the game with a leg injury, and was eventually playing lamely out of a forward pocket. Carlton used Harry Vallence and Paul Schmidt as wide half-forward flankers to provide space to centre half-forward Jack Wrout. Additionally, Ken Baxter was told to sit in the forward goal square, to force Collingwood's fullback Regan to man him up and deprive the Pies of his run. This tactic was very effective and left Wrout as the most effective forward on the ground, kicking 4 goals. The Blues also used Jack Hale, Albert 'Mick' Price and Jim Park to mark Collingwood's Fothergill, Pannam and Todd. These tactics helped to nullify these players and left the Blues in a good postion to win the game. As well as being one of Carlton's best players in both finals, Brighton Diggins had brought discipline and tactical nous to the Blues. Todd kicked the first two goals for Collingwood, but was answered by goals from Albert 'Mick' Price and Creswell 'Mickey' Crisp. Carlton trailed slightly towards the end of the term, but in a brilliant time on period managed goals to Baxter and Bob Green, and 2 goals to Wrout. At half-time the Blues had a comfortable 20 point lead. The Pies closed on the Blues early in the third, but Diggins managed a goal to re-establish a handy 17 point break at the last change. Collingwood's Forthergill escaped Hale's close attention in the last, to kick 3 of the Pies 5 goals, the last of these closing the gap to only 4 points. Jack Hale redeemed himself with a brilliant mark in Carlton's forward line, and kicked a goal. Baxter kicked another from a pass from Wrout, and the Blues 23 year premiership drought had ended. "With the game in the balance, the crowd became particularly demonstrative, 80,000 of the 96,000 barracking for Carlton. A free against the dashing Hale, outright hero of the match, was vigorously hooted by thousands, and a counter free against Collingwood was cheered to the echo." With time-on about to start in the final quarter,Todd from a spectacular mark goaled to reduced the margin to just 4 points. "Then came one of the greatest finishes ever staged by any Carlton side in the last twenty years. Hale, if the League awarded a Victoria Cross, would have received the decoration for the punishment he took in securing a mark in the middle of a fierce goal base crush. His face was ashen grey when he took his kick, and the whole ground seemed to rock with excitement and applause as the ball made the goal." "Carlton's 80,000 supporters were delirious with delight a minute later when solid ruck work by Diggins & Co., and a lightning-like drive ended with Baxter, who excitedly grasped the ball, wheeled, and drove it straight through the goal. There were then only ninety seconds to play. With never-say-die spirit, Collingwood reattacked, a shot by Fothergill just on the bell missing what should have been a certain goal." "The tension remained to the end. In fact, there was such sustained excitement that the huge crowd combined in one mighty yell of relief and delight as soon as the famous old Lysander bell started to toll. Thousands rushed from the fence, the players being surrounded by hundreds of overjoyed Carlton barrackers." Blues break drought after 23 years. Carlton's appointment of South Melbourne 1933 Premiership centre-half forward Brighton Diggins as captain-coach for 1938 brought them the Premiership Flag. They beat Collingwood by 15 points. The Blues, who had finished outside the Four in 1937 despite some brilliant players, have now become a polished, powerful and very fit unit. Carlton finished the year a game clear on top, losing four matches including one to Collingwood. They sailed through the Second-Semi against Geelong, winning by 32 points, Ken Baxter kicking eight of those goals. Collingwood also disposed of Geelong in the Preliminary Final by 37 points, setting up a much anticipated contest. A record crowd at an Australian sporting event, 96,834, witnessed a splendid Grand Final, with Carlton holding the edge in the first half. Collingwood got to within nine points in the third term, before Diggins defence steadied the Blues. The Magpies came on again in a thrilling last quarter and were only four points down with minutes to go. Goals to Jack Hale and Jack Wrout sewed it up for the Blues. It wasn't a day for full-forwards. 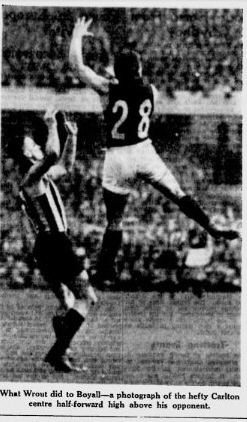 Jack Regan keeping Carlton's Harry Vallence to one goal, and Jim Park holding Ron Todd. Diggins was best-on-ground. - 100 Years of Australian Rules Football. One of the heroes of Carlton's Premiership win in 1938 was Jack Hale, their indomitable rover. He played a big part in upsetting the famous Collingwood machine in the Grand Final by muffling the Magpies champion rover, Brownlow Medallist Des Fothergill. It was part of the plan. Hale was to go on the ball when Fothergill did. Albert 'Mick' Price had similar instructions about Collingwood's other great rover, Alby Pannam. The plan worked perfectly for four quarters. Carlton went to an early lead and were 22 points in front as the match entered the fourth quarter. Coliingwood threw out a strong challenge in the final term and got to within four points of Carlton, but the Blues were able to check them. Although nearly exhausted through shadowing Fothergill. Hale rose for a superb mark above the pack and goaled to ease the intense pressure. A goal by Ken Baxter clinched the game. The Blues won the Grand Final by 15 points. It was Carlton's first premiership for 23 years. Former West Australian and South Melbourne ruckman, Brighton Diggins, was their captain-coach. - Football Record. Collingwood coach Jock McHale was foreman at the Carlton brewery, and the Blues smelt a rat when its captain-coach Brighton Diggins had to clean barrels in the steam room on the morning of the match. Meanwhile, fellow brewery worker, Pies acting skipper Albert "Leeter" Collier, had the day off. Carlton still won the Grand Final by 15 points. Carlton won its first premiership since 1915 in the Victorian Football League grand final, at the Melbourne Cricket Ground on Saturday. The official attendance of 96,834 and gate takings of £6,778/9/3 easily broke the previous record figures for the ground - made when Geelong defeated Collingwood in the grand final last season. Long before the curtain raiser finished, the pressure from the crowd in the outer reserve was so great that the iron fences gave way and the crowd swarmed onto the arena. The game started with thousands seated five deep between the fence and the boundary line. More than 70 ambulance men and nurses were kept working at top pressure attending 124 cases brought into the casualty room. Last game: This was Harry 'Soapy' Vallence's 204th and last game for Carlton, having kicked a club record 722 goals for the Blues. Last game: Tragically Jim Park was killed on 9/2/1943 whilst in active service in the Australian armed forces during World War II. Contributors to this page: blueycarlton , pblue , Bombasheldon , Jarusa , molsey , timmyd , BlueWorld , WillowBlue , camelboy , steve and admin . Page last modified on Monday 09 of February, 2015 16:08:14 AEDT by blueycarlton. 1972 Rd 6 - Match Summary Vs Geelong. 1993 - Sheldon sacking: Saints got it wrong (15/09/93).